Everyone’s looking for healthy and homemade foods these days, but even as demand soars, chefs, small-batch cooks, and caterers are scrambling to find kitchen space. Enter The Cauldron Kitchen, which opened in January and now provides a commercial kitchen, cooking classes, and even a limited lunch menu — all out of one compact space in Vanier. Dave Neil, co-owner of Westboro’s The Piggy Market, realized the idea in partnership with David Villarroel, an engineer who knew there must be pent-up demand for commercial kitchen space given that small food retailers like The Piggy Market, as well as larger concerns like Farm Boy, love to carry local products but health regulations stipulate that they must be prepared safely in a commercial kitchen. City Bites Insider caught up with Dave Neil to quiz him on who (and what) is cooking in The Cauldron Kitchen these days. 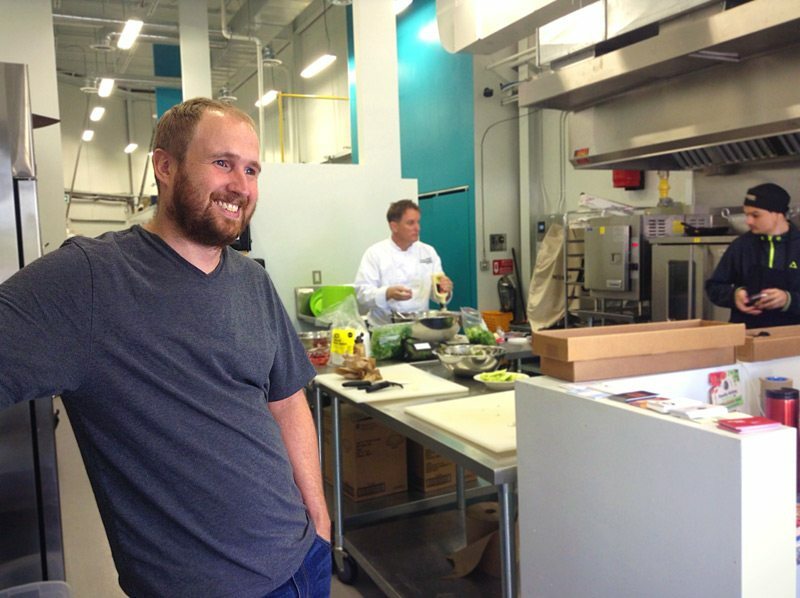 Dave Neil, co-owner of The Piggy Market, is now a partner in The Cauldron Kitchen, a new commercial kitchen space in Vanier geared towards chefs, caterers, canners, and other small food producers who need kitchen space. We got going in January. There has been lots of interest since the very beginning — there are so many people who are curious about starting a food business and want to know how to make it happen. I’ve been offering kitchen tours three or four times a week since we opened, and many of the people who toured last spring are just now starting to book space. Tell me how The Cauldron Kitchen works. It’s a partnership with David Villarroel, who’s an engineer. The concept for this commercial kitchen was his idea, but he wasn’t sure how to make it happen. When he contacted me about opening a kitchen, I saw the benefits right away. For example, at the Piggy Market producers are always coming in with their pickles or jams or other food products and asking me to taste them and sell them. My first question is always ‘Where did you make it?’ We can’t sell food that isn’t prepared in a commercial kitchen. Their answer was always ‘There isn’t one available.’ It’s tough to find a commercial kitchen geared to small producers. There’s one commercial kitchen with all the basic equipment anyone would need. The second kitchen is a bakery kitchen with its own stainless steel tables and a separate oven. Then there’s a third space, which is a smaller prep area. People rent this for prepping and packing food. We’ve also got big walk-in freezers where people can store food. 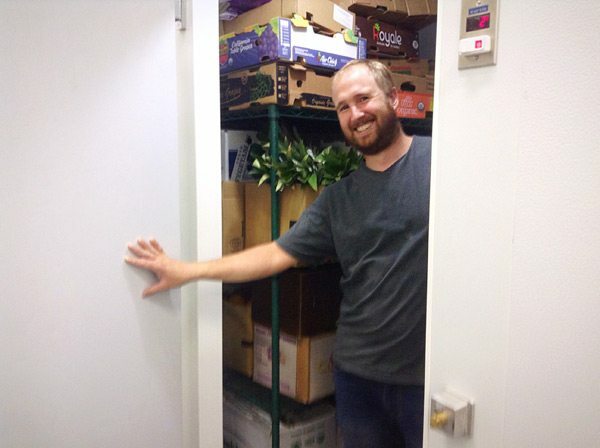 Neil steps out of the walk-in fridge, one of two situated at the back of the space. Any businesses I know renting space? Savoury Pursuits is here five days a week baking. Lots of people know them from the Ottawa Farmers’ Market. 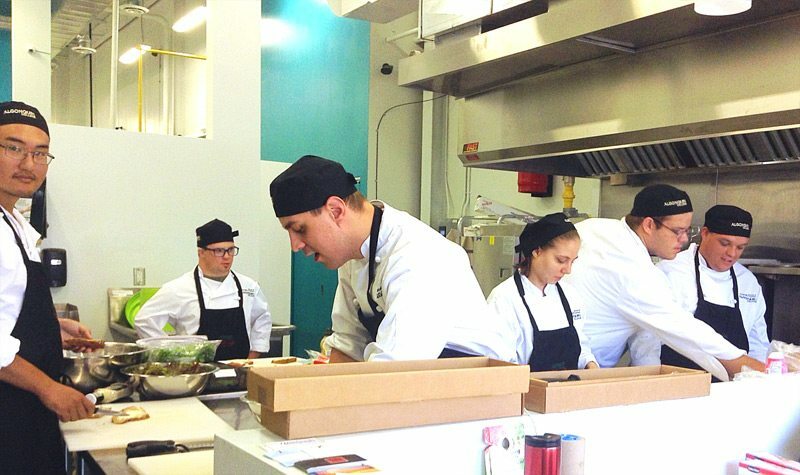 VeggieDrop, a new organic delivery business uses our kitchens to prep. Tandoori Fusion, which is a catering business, works here. Lots of people know the Gongfu Bao cart — they rent space on occasion. The kitchen is open 24 hours so people can work at times that suit them. Regulars at the Ottawa Farmers’ Market will be familiar with the sweet and savoury pies, soups, and quiches made by Savoury Pursuits, whose staff rent the kitchen five days a week. Can people book the kitchens as a one-off? Of course! One client we had was an 11-year-old boy who wanted to try his hand at selling his baking at one of the farmers’ markets. His parent booked the kitchen and he cooked his banana bread and brownies. I see you’re somehow finding time to run cooking classes out of The Cauldron Kitchen. Where did that idea come from? I’ve offered sausage-making and cheese-tasting courses at The Piggy Market for a long time and also teach charcuterie at Algonquin. So food education is something that’s really important to me and something I like to do. I teach some courses, along with other cooks and chefs with different specialties. Students with exceptional needs learn cooking skills through a partnership between Algonquin College and Christian Horizons. They rent the large commercial kitchen space at the front of The Cauldron Kitchen. Canning is huge right now and it’s the perfect time of year for our canning workshops with harvest season in full swing. The knife skills classes are popular and we have vegan cooking classes. How are you splitting your time between The Cauldron Kitchen and The Piggy Market? Because this business is new, I’m at The Cauldron Kitchen a lot. I’m still at The Piggy Market a lot, too, but I’m not on the regular schedule. I really love being involved with a new business — this has rejuvenated me. I love consulting with people, learning about new food businesses that are just about to launch, and helping educate people about food and how to get more good food out there. Last question. I hear you’re doing soups, salads, and sandwiches at lunchtime? We are. It wasn’t part of the original plan, but there’s not much around here except a Starbucks and a chip wagon, so we’re doing a quick lunchtime menu. That’s a work in progress, so check the website to see what we’re making.